Rain will stay well east of the Finger Lakes on Tuesday, but will return for Wednesday. Even though it will remain dry today, the clouds will likely remain fairly thick over the majority of the region today. That is not to say that there will be no sun. In fact, at least a few breaks in the clouds are likely, especially for areas further west. The amount of sun that does manage to break through the clouds will have an influence on the temperatures as well, with highs ranging from the mid to upper 50s. A few places could even hit 60 degrees if they get enough sun at the right time. Skies will become overcast again tonight, and some scattered rain showers will start to show up during the second part of the night. Showers will increase in coverage for the day tomorrow. The rain will be on and off, not a widespread steady event. 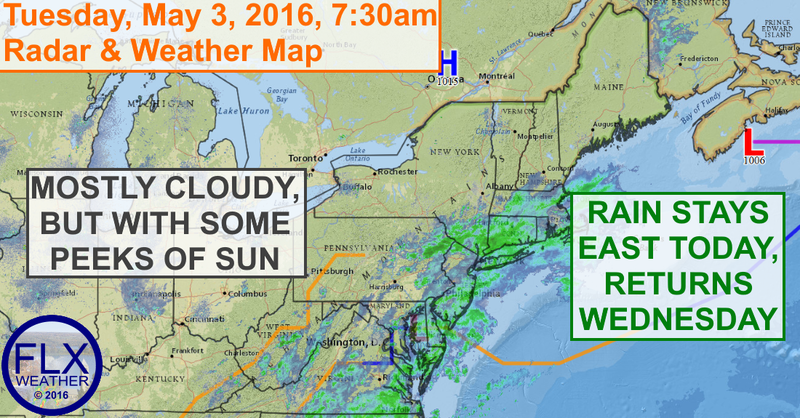 Areas further east will have more rain, while areas to the west may see more dry periods. With the clouds and showers, highs will only reach the low 50s. Thursday and Friday will both have a chance for some rain showers, but uncertainties remain in how much rain is to be expected. Thursday’s rain chances look higher in the west, while Friday looks wetter further east. High temperatures both days should be in the mid 50s. Saturday is looking like a great day, with some sun and highs in the upper 60s to near 70 degrees. This will just be a one day taste of nice weather though, as Mother’s Day looks showery and cool and next Monday isn’t much better.